To help children learn to read, some of Dr. Seuss’ books were written using a limited vocabulary. As a result, these books contain an abundant amount of sight words, repeated text, rhyming schemes and entertaining illustrations – the ideal reading material for a child learning to read. Book Review: Unless you live under a rock, you have heard all about this book or watched the classic Christmas cartoon(1966) or movie (2000) . No review deemed necessary. 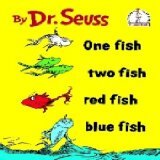 Book review: This is one of my favorites Dr. Seuss Books! Many moons ago, I received this book along with a lovely note from a dear friend so this book is not only inspirational but also sentimental to me. Amazon.com gave said the following, “Inspirational yet honest, and always rhythmically rollicking … the incomparable Dr. Seuss rejoices in the potential everyone has to fulfill their wildest dreams.” School Library Journal said, “Although this does not rank among the best of Seuss’ books, its stress on self-esteem and imaginative artwork make it a good addition to picture-book collections.” Perhaps they were evaluating it from only an educational perspective.